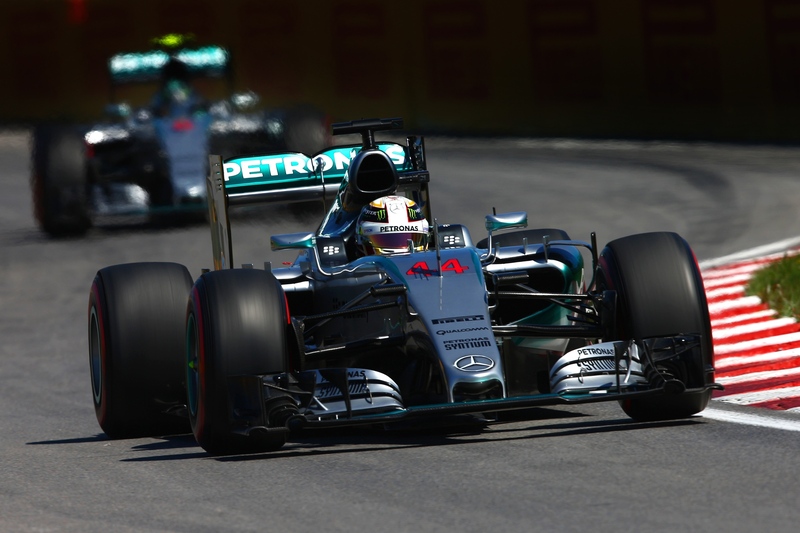 Lewis Hamilton has claimed pole position for the 2015 Canadian Grand Prix at the Circuit Gilles Villeneuve. The British driver took his 44th pole position by 3 tenths of a second ahead of his team-mate Nico Rosberg and Ferrari’s Kimi Raikkonen. Sebastian Vettel put in a shocking performance for all the wrong reasons, with power problems on his Ferrari meaning that he couldn’t advance past Q1. After not getting in the laps he wanted to in the final practice session, Lewis Hamilton was the first out onto the Circuit Gilles Villeneuve for the 18 minutes Q1 session. Nico Rosberg had topped third practice earlier on in the way in an interrupted session thanks to two red flags; one for a stoppage for Jenson Button’s McLaren and one for a crash with Felipe Nasr. Hamilton was quick to get back to where he wanted to be, on top of the session, as he soon get into the 1’15’s on the soft compound tyre. Nico Rosberg would best him not too long after with a time just 2 thousandths faster. This would be curtains for the Silver Arrows session as they’d done enough to not be knocked out at the end of the session. With 5 minutes left in the session, 2 drivers had yet to set lap-times. One of them was Jenson Button, who would not be attempting to venture out onto the circuit after his mechanical demons continued to plague his McLaren-Honda. The 2nd was Sebastian Vettel, who had reported problems with his MGU-K unit in FP3 and then reported further problems at the start of the session before peeling immediately into the pits. Vettel did make it out onto the track with just over 2 minutes to go, enough time for one flying lap on the super-soft tyre to try and steal a spot in the next session at the last moment. His problems seemed to still be harming his speed however as he was barely keeping pace with Fernando Alonso. He managed to get into P16 but he could do no more. He would be eliminated in Q1. Another shock elimination would be Felipe Massa, who was appearing to have similar power issues. They would join the two Manor cars and Jenson Button and would have to spectate the rest of qualifying. Mercedes’ status quo continued at the start of the 2nd qualifying session, with the Silver Arrows getting back up to the top of the times before heading back to the pits for the remaining minutes. Lewis Hamilton came through with the fastest time of the weekend so far, a 1’14.661, but Nico Rosberg had set faster times in the first 2 sectors. For some reason however, Nico lacked pace in the last sector and ended up 1 hundredth behind his team-mate. Mercedes were definitely the engine of choice in Montreal. Unsurprisingly, the 5 cars in the drop-zone with a minute to go were all Renault, Ferrari or Honda powered. Fernando Alonso trying to improve from P15 and managed to vault up to P13, but there was no way he would be able to sneak into Q3; he would soon be knocked back down in P14 anyway. Daniil Kvyat had been set for elimination until the dying moments, with a last minute lap putting him ahead of the 2 Toro Rosso drivers. Sainz would be eliminated in 11th, with Verstappen set to start plum last with more penalties to come in the race after penalties for his collision with Grosjean last time out and for an unscheduled engine change. The 2 Toro Rosso’s would also be joined by the 2 Sauber drivers; with Ericsson and Nasr ending the session in 13th and 15th. 7 of the 10 runners in Q3 had Mercedes power behind them. 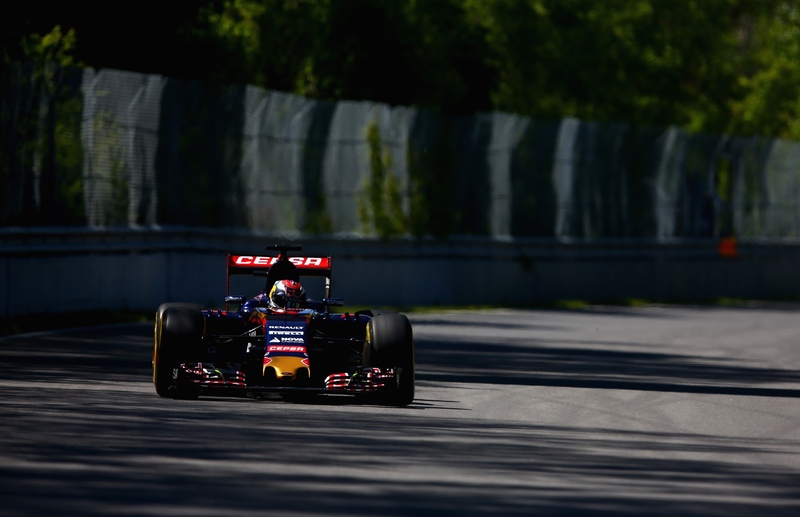 Only the Ferrari of Raikkonen and the Red Bull drivers differed. The fight for pole position looked to well and truly be between the works Mercedes drivers, with Lewis Hamilton and Nico Rosberg taking 1st and 2nd after half of the session. One more run still remained for Nico Rosberg to try and bridge a 3 tenth gap to Hamilton. One crumb of comfort for the German was that his tyres he’d use for his final push were much better than the ones he’d just had bolted to the #6 car. Lotus were demonstrating the benefits of a Mercedes power unit by having their best pace of the year. They were 4th and 5th after their 1st runs and were less than a tenth off of Raikkonen in 3rd. Strangely, the two Lotus cars were released at exactly the same time for their final runs, which led to the unusual sight of side-by-side action in the pit-lane and out onto the track. Kimi Raikkonen was one of the first to set a time on a second run, with a slight improvement keeping him in 3rd. Ferrari elected to have 2 flying laps as opposed to Mercedes who put both of their cars on an extra warm-up lap before one flyer. His fellow countryman Valtteri Bottas’ lap was enough to put him just behind in 4th. Raikkonen’s 2nd lap was abandoned after a ‘heart-in-mouth’ moment where he narrowly missed the wall on the exit of turn 4. Both Mercedes drivers were out on track for a final run, but neither driver would improve on their previous laps. This was a disappointment for Rosberg who later radioed the team remarking that it was a ‘rubbish end to qualifying’. His team-mate was slightly happier, as he had taken his 44th pole position and will have the best view on the run down to turn 1 in the #44 Silver Arrow. Kimi Raikkonen lines up just behind Mercedes on the grid. 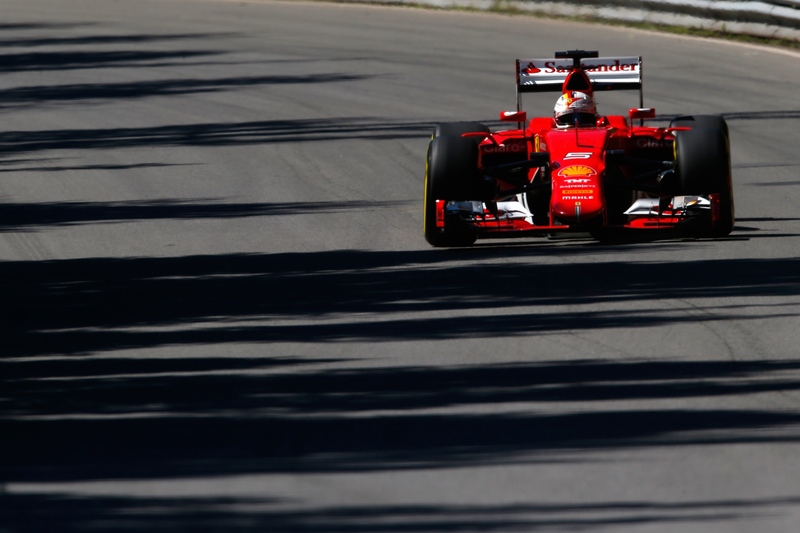 All eyes will be on his race pace, with the Scuderia looking slightly closer to the Silver Arrows during practice. Valtteri Bottas will take the 4th spot on the grid ahead of the all Lotus 3rd row; with Romain Grosjean out-qualifying Pastor Maldonado by 2 tenths. The Force India drivers sandwiched the Red Bull duo, with Hulkenberg and Perez 7th and 10th and Kvyat and Ricciardo 8th and 9th.